Following the huge success of its inaugural saddler scholarship last year, Abbey England launched the 2019 award last August. 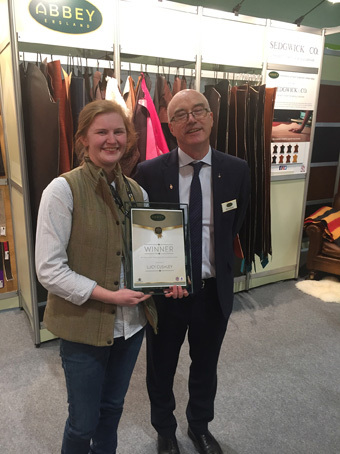 The winner has now been chosen and we can announce that the Abbey England Saddlery Scholarship apprentice for 2019 is 26-year-old Lucy Cushley. Lucy has won £500 to spend on workshop tools from Abbey England. Saddlery student Lucy has always been interested in saddlery and tack since she was a small child growing up with horses around and has a true passion for good craftsmanship and working with leather. She has completed her City & Guilds Level 2 in Saddle, Bridle and Harness Making at Capel Manor College along with a course on flocking and is now working towards her Level 3 Diploma and is also due to start on a lorinery course this year. Based in Northern Ireland, she is currently being mentored by Master Saddler, James Adair. Once qualified, her aim is to become a Master Saddler and eventually open a training centre in Ireland and educating people as she works, showing them why buying quality matters and really does make a difference in the long run. In her own words she would like to “bring saddlery back to Ireland”. Being based in Northern Ireland hasn’t made things easy for Lucy. With no bursaries available over there, she has had to make the journey many times over to England where the industry is mainly based, to learn the skills necessary and has taken every opportunity to attend courses and workshops to promote her learning. She has a true passion for working with leather and enjoys the variety that each leather hide brings, with its own problems and characteristics, just waiting for a skilled craftsperson to bring it into its own..